A pair of traditional Chatsworth 1928 chrome 5 inch spout basin taps, create a traditional feel in your bathroom with these classically styled luxury basin taps. Manufactured from brass with a polished chrome plated finish. 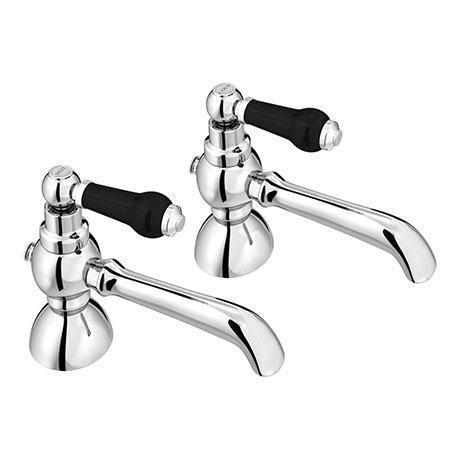 Features decorative black lever handles with classic chrome indices. Transform any bathroom’s decor to the luxury and elegance of yesteryear. These taps look good on both bath and basin. They feel decent quality and fit easily.Long reach spout in basin means you are able to get your hands under the flowing water.